Have you ever wondered whatever happened to the “Happy Huskers” lottery syndicate who walked away with a $95 million lottery jackpot 14 years ago? Well according to two of their members they’re all well and happy. A Wilmington man has captured the top prize of the Massachusetts Lottery’s $200,000 a Year For Life game. The lucky winner, who used to be a top wrestler and football player at Wilmington High School, is Alexander Furlong. You can say Gladys Salzwedel, of Oakley, Michigan is twice lucky. First her Mega Millions entry managed to match all five white balls drawn on the Oct.
One moment Miguel Mendoza was broke, then suddenly he’s awash with money. That’s how quickly an instant ticket win can change your life. Mendoza who lives in a blue mobile home, invests anywhere from $5 to $20 hoping for a chance to improve his financial standing. Here’s a tip for those who want to hit it big in the lottery – buy coffee every morning and get a few tickets before you go. This week two women struck lottery luck. 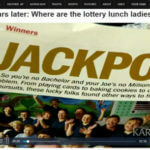 Katrina Vosler of Wyoming won $964K which must be a reward for regularly playing the lottery. In Michigan, Amanda Dietz won $300,000 after giving a speech about clearing debt. A man from Cork, who had been going through immense financial struggles, put his hopes on winning a big prize and the lottery came through for him. This story is sure to make you feel good. A fencing contractor gets interviewed after winning a million dollars of an instant lottery ticket. When you’ve got millions you can do almost anything. 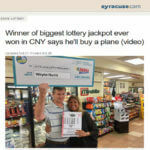 This is what an electrical engineer from Homer found out after posting a huge lottery win and then deciding he wants to buy a plane.